MAJOR FASHION CRISIS: this year's Conservative Political Action Conference (CPAC) starts tomorrow, and I still have no clue what to wear to meet my idols Donald Trump (who still hasn't responded to our Miss USA expose, btw), Marco Rubio, Mitt Romney, Jeb Bush and Sarah Palin! Whatever shall I do?! 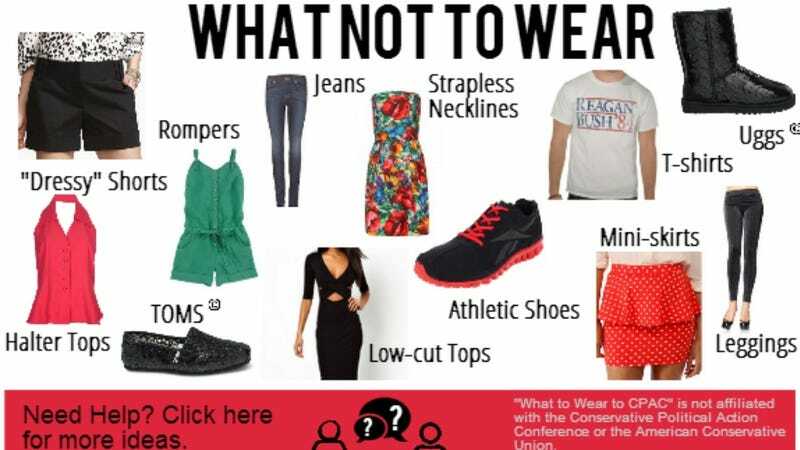 Luckily, one Pinterest user put together a handy wardrobe guide for CPAC, which sounds a lot like sorority rush sans halter tops. There are lots of Pinterest paper-doll cutout examples of what you should wear: — '90s conservative casual, essentially — and then there's what not to wear: "Dressy" shorts, halter tops, TOMS, rompers, jeans, strapless necklines, low-cut tops, athletic shoes, mini-skirts, leggings, T=shirts (even if it's vintage Bush) and Uggs. I'm still unclear on whether I can bring my Paul Ryan trucker hat and cherry-red slanket, so please advise down below.